Mahogany should be avoided unless it originates from non-old growth logging and is certifed by an organization accredited by the Forest Stewardship Council. There are numerous species of mahogany and a number of other species of trees called mahogany in trade. Generally, “true” mahoganies are those in the genus Swietenia, the species of which are found throughout the Caribbean and Central and South America. However, species from Africa in the genus Khaya are also considered mahoganies as they are distantly related. There are four species of Sweitenia in Latin America: Caribbean mahogany (Swietenia mahogani), Honduran or Pacific Coast mahogany (Swietenia humilis), bigleaf or big-leafed mahogany (Swietenia macrophylla) and Venezuelan mahogany (Swietenia candollei). There is much confusion as to their common names, with bigleaf mahogany often being called true mahogany, geniune mahogany, South American mahogany or Honduran mahogany. Local common names include acajou and caoba. The history of mahogany logging is linked inseparably to the history of colonialism. Prized originally by European furniture makers for its dark color, stability and ability to be scrolled without breaking, mahogany was first targeted shortly after Columbus invaded the New World. The history of mahogany logging is also a history of deforestation in the Caribbean and Central and South America. 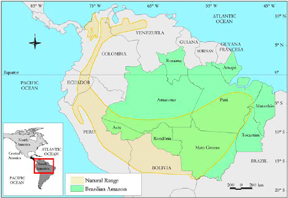 The wave of logging that began in the 1500s and has expanded out from the original point of European invasion of the Americas and continues to this day is nearly identical to the expansion of the mahogany frontier. Swietenia mahogani, known as Caribbean, Cuban or true mahogany, is found from the tip of southern Florida and throughout the West Indies. Swietenia humilis, known as Honduran mahogany, is found on the Pacific coastal region of Central America. Both of these species are listed in Appendix I of the Convention on Trade in Endangered Species of Flaura and Fauna, known as CITES. This means that countries trading in these species need to verify that sources are legal and sustainable and all trade must come with paperwork showing origin. The majority of the trade in mahogany is currently bigleaf, S. macrophylla. This species is now listed on Appendix II of CITES after decades of lobbying by environmental groups and counter-lobbying by industry groups. 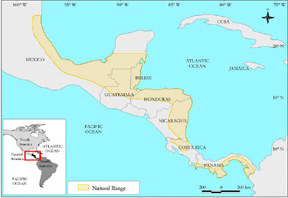 Bigleaf ranges from the north of the State of Veracruz to Yucatan in Mexico, along the north Atlantic slope of Central America to Venezuela and Brazil. It also occurs in Colombia, Peru, and Bolivia at elevations of up to 4900 feet (1500 m), and on Cape Verde Islands. Bigleaf mahogany is an emergent tree, growing to heights of over 150 feet and diameters of 6 feet. It is a sun-loving tree, rapidly growing in clearing and then reaching heights that take its crown above the canopy. The US is the largest importer of mahogany by volume and by dollar value. US demand helped to decimate the populations of Caribbean and Honduran mahogany. Later, big-leafed mahogany was targeted, first mostly in Central America. US mahogany imports from around 1900 to 1960 were almost entirely from Belize and Mexico3. Mahogany in these countries has been reduced to third-rotation trees that are still being cut, often illegally, before they even mature. US imports from 1960 to 2002 were largely from Brazil, Bolivia and Peru. Since Bolivia's change in forestry law, exports of mahogany have fallen. From 1995 to 1998, U.S. imports from Bolivia decreased by two-thirds, while U.S. imports from Peru surged nearly fourfold4. Further, with Brazil's recent crackdown on illegal mahogany logging (after decades of calls by environmental organizations) and Bolivia's shift to mostly certified logging operations, since 2002, Peru has become the largest exporter to the US. Much of the logging there is illegal, as most of it was in Brazil and much of it in Bolivia. A comprehensive profile of big-leaf mahogany can be found at Global Trees Campaign, http://www.globaltrees.org/reso_tree.asp?id=35. Typically Khaya ivorensis, but also other species in the Khaya genus are sold as African mahogany, including K. anthotheca, K. grandifoliola, and K. senegalensis. Khayas are grand trees, reaching heights of 110 to 140 feet with trunk diameters of as much as 6 feet. Khayas are found from the Ivory Coast to Gabon and Cabinda, and are primarily found in the Ivory Coast, Ghana, and Nigeria. The largest exporters to the US are Ivory Coast and Ghana. 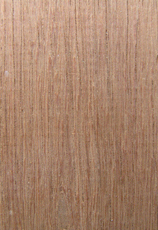 Sapele (Entandrophragma cylindricum) is sometimes sold as African mahogany and ranges through Cameroon and Democratic Republic of Congo (Zaire). These species are heavily targeted by illegal loggers in Africa and as well, many of these countries allow for overlogging that is not sustainable. IUCN lists these species as vulnerable in much of their range, due to overlogging. As well, logging in Africa is the key factor leading to a massive illegal trade in bushmeat that is devastating populations of endangered wildlife, including chimps, gorillas, pangolins and other animals. Loggers bulldoze new roads into pristine forests and bring along hunters with them to hunt meat for the logging crew. Those hunters kill extra and bring their catch back to the towns and cities using the logging trucks. Entire forests have been denuded of their large wildlife. See "Bushmeat: Logging's Deadly 2nd Harvest" in our Articles section or download the article as a PDF by clicking here. One way to curtail this illegal trade is to reduce the demand for these woods. Mahoganies are typically used for high-end indoor furniture, outdoor furniture, custom woodworking, foyers, entry doors, window frames, decking, caskets, humidors and craft items. The majority of US imports goes to the furniture industry with Stickley being one of the largest single importers, particularly for their Colonial Williamsburg line. Other companies using mahogany include Henredon, Lane, Drexel Heritage, Ethan Allen, Hickory Chair and many others. Avoid these companies' products and let them know why. 3. Traffic, Mahogany Matters: The U.S. Market for Big-Leafed Mahogany and Its Implications for the Conservation of the Species, October, 2000, http://www.traffic.org/mahogany/.